Our customizable event package is determined by an hourly rate and comes with all the tables and chairs we have available as well as any required security for your event. You will have access to the outdoor courtyard/garden areas as well as the Victorian gazebo and the rustic barn. We have a four hour minimum rental but after the four hours are met, you can add any amount that you would like to complete the pre-event decorations and setup, the event itself, and any necessary teardown and cleanup. We would be happy to provide you will more details about many of the other great aspects of the rental! We enjoy meeting our event planners, grooms, brides, and families, so please email and schedule a time to visit. If you have more questions, we would love to answer them more specifically so don't hesitate to get in touch! -White-Pool House Management. The Rustic Barn is pre-decorated with string lighting and has an old-world charm to it. The barn will hold 125 guests, and works well for dancing, dinner, or wedding ceremonies. We have just recently added a beautiful and charming 20'x40' Victorian, white, wooden gazebo next to the barn event space. This adds a great complimentary area to the existing barn dance area. 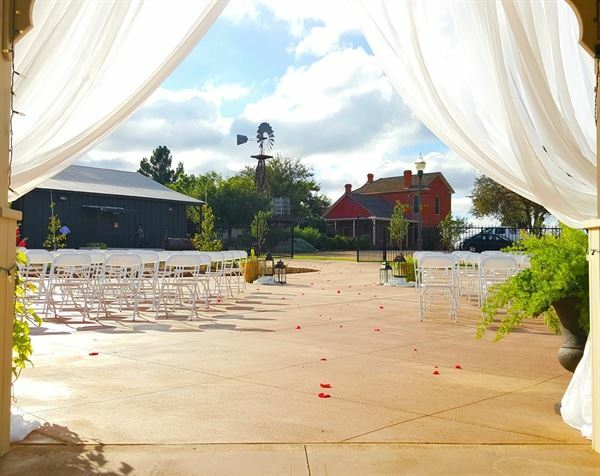 With the acclimate weather in Texas most of the year, each event is sure to get great use of this new outdoor event space.